Designed for experienced sailors planning to spend months at a time on board, a terrace, and the privacy, quiet and incredible views that come with it, was a must for the owners of 50 metre Rossinavi Endeavour II. Currently listed for sale with Fraser and for charter with Ocean Independence, the fold-out balcony is located on the starboard side of the owner's suite and the elegant style of interior designer Achille Salvagni extends to this area thanks to a Gio Ponti chair sourced at auction and featuring a low centre of gravity so guests feels less roll. Designed for experienced sailors planning to spend months at a time on board, a terrace, and the privacy, quiet and incredible views that come with it, was a must for the owners of 50 metre RossinaviEndeavour II. Currently listed for sale with Fraser and for charter with Ocean Independence, the fold-out balcony is located on the starboard side of the owner's suite and the elegant style of interior designer Achille Salvagni extends to this area thanks to a Gio Ponti chair sourced at auction and featuring a low centre of gravity so guests feels less roll. The 45.72 metre flagship from Wider Yachts, the Wider 150_ _is packed with technological innovation and the main deck master suite is a perfect example of this. To starboard, a broad window powers open automatically for fresh air under way but close that window and a much larger, marble-clad section of superstructure folds out. Touch the button for longer and teak decking slides out from under the floor and railings rise up. 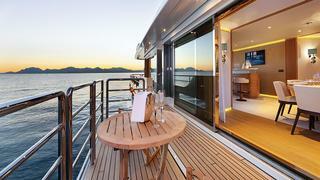 It is an immaculate superyacht terrace with decking flush to the interior floor. It looks and feels like a permanent feature, not a temporary fix, and yet it’s easy enough for an owner to erect without the help of crew. Just as importantly, since it will be closed most of the time, when stowed you wouldn’t guess it was there. The 45.72 metre flagship from Wider Yachts, the Wider 150_ _is packed with technological innovation and the main deck master suite is a perfect example of this. To starboard, a broad window powers open automatically for fresh air under way but close that window and a much larger, marble-clad section of superstructure folds out. Touch the button for longer and teak decking slides out from under the floor and railings rise up. 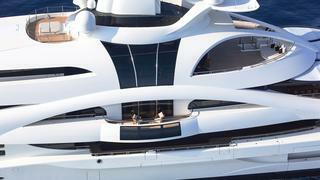 It is an immaculate superyacht terrace with decking flush to the interior floor. It looks and feels like a permanent feature, not a temporary fix, and yet it’s easy enough for an owner to erect without the help of crew. Just as importantly, since it will be closed most of the time, when stowed you wouldn’t guess it was there. 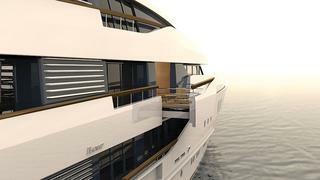 The balcony on Feadship’s new 66.25 metre superyacht Vanish is built-in under the master suite. Touch a button and, hey presto, it extends out and the floor rises to sit flush with the suite, offering a seamless transition to the balcony and superb views. In fact, the terrace is one of the things her owners are most excited to enjoy, following the delivery of Vanish. They like being close to the water, according to Feadship director Jan-Bart Verkuyl, and this terrace will help them do just that. 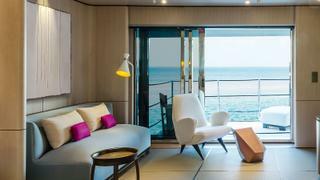 The balcony on Feadship’s new 66.25 metre superyacht Vanish is built-in under the master suite. Touch a button and, hey presto, it extends out and the floor rises to sit flush with the suite, offering a seamless transition to the balcony and superb views. In fact, the terrace is one of the things her owners are most excited to enjoy, following the delivery of Vanish. They like being close to the water, according to Feadship director Jan-Bart Verkuyl, and this terrace will help them do just that. Full-height glass doors on the starboard side of this dining saloon open to a balcony that folds down from the bulwark of 34 metre Mulder yacht Solis, which is listed for charter with Camper & Nicholsons. 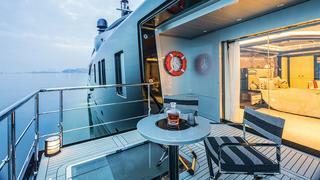 This superyacht balcony helps bring the inside out and is perfect for pre-dinner cocktails. A breeze flows all the way through Sanlorenzo’s SD112 _O _– thanks to fold-down balconies to port and starboard that extend to open up the saloon. 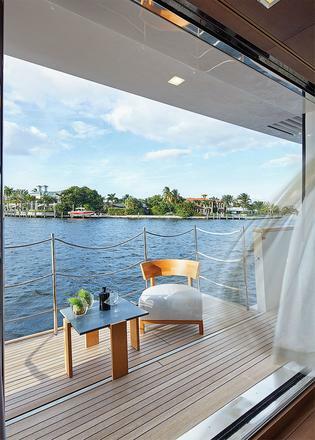 "Usually you think full-beam gives you the view, but if you can open the door and have a private terrace for sunbathing or breakfast, you have the view and so much more,” her owner told Boat International. A breeze flows all the way through Sanlorenzo’s SD112 _O _– thanks to fold-down balconies to port and starboard that extend to open up the saloon. "Usually you think full-beam gives you the view, but if you can open the door and have a private terrace for sunbathing or breakfast, you have the view and so much more,” her owner told Boat International. A permanent terrace (no deploying necessary) on the upper deck has glazed inserts and goes with the flow of 96 metre Blohm+Voss Palladium’s curvy design. 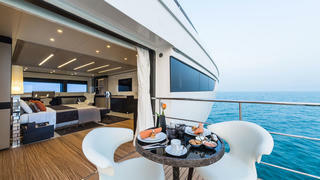 The master suite of 66.4 metre ISA yacht Okto, which is currently for sale with Fraser,_ _is a great place to chill out. Even with balcony doors open, cooler air stays inside thanks to an air-curtain barrier, which also helps keep bugs out too. There's even a technical solution for slotting in the guardrails that doesn't require the crew – simply push a button and they fold up out of the balcony. 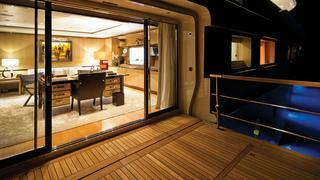 The master suite of 66.4 metre ISA yacht Okto, which is currently for sale with Fraser,_ _is a great place to chill out. Even with balcony doors open, cooler air stays inside thanks to an air-curtain barrier, which also helps keep bugs out too. There's even a technical solution for slotting in the guardrails that doesn't require the crew – simply push a button and they fold up out of the balcony. Easily distracted? The owner’s office on 80 metre CRN Chopi Chopi has a large fold-down terrace that makes a tempting spot for a breath of fresh air or a nap in a lounger.